Port Townsend’s museums and centers. Except where listed otherwise, sites are open from noon to 4pm on days of the festival. Admission cost to museums and sites, if any, is paid at the door. The General Pass does not cover independent museums. The Commanding Officer’s Quarters is located at Fort Worden State Park & Conference Center, 200 Battery Way, Port Townsend. The house is one of Fort Worden’s finest buildings. It was completed in April 1904, and many different families resided there. 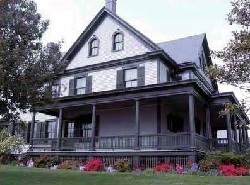 Located at the head of Officers’ Row, the Commanding Officer’s Quarters overlooks Admiralty Inlet, with Mt. Baker and the Cascades in the background. Late Victorian and Edwardian furnishings provide a unique glimpse into the life of a senior U. S. Army officer and his family in the first decade of the 20th century. If you like the art deco era and wish to learn a bit more about the lights that graced the homes during that exciting time in America’s visit the Kelly Art DecoLighting Museum. Located at 2000 W. Sims Way, this free museum provides a rare glimpse into he years 1928 to 1938. The variation of designs is amazing. This is the ONLY American Art Deco slip-shade light museum in the world today. Some are so rare that no books have ever documented them and many became obsolete before a catalog could be made to sell them. Stop in for a truly unique experience. 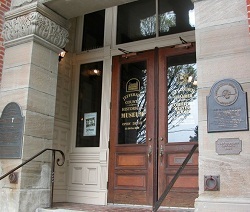 The Jefferson County Historical Society Museum is located in the 1892 Port Townsend City Hall building. Exhibits in the former municipal court room, fire hall and jail spaces illustrate the lively history of communities born in waterfront forests over 150 years ago. Step through the kitchen door of the Rothschild House and step back to the 1800’s. Located at the corner of Jefferson and Taylor Streets in uptown Port Townsend, the Rothschild House is virtually unchanged from a hundred years ago. D.C.H. Rothschild, or the Baron as he became universally known, was born in Bavaria in 1824. After traveling extensively around the world and engaging in several business enterprises, he settled in Port Townsend in 1858 and began a business under the name of “Kentucky Store.” It was soon changed to the Rothschild and Co. Mercantile, selling varied merchandise.